Did you drink this growing up? It is sooo good. Mix everything up in a HUGE bowl and put it into smaller containers. 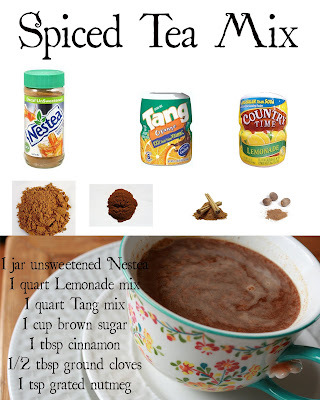 Add 1 tablespoon of mix to a mug of boiling water! Yummm....It's a little ghetto-licious... But don't let that stop you from trying it! These measurements are to taste, add a little more or less of what you like. Great for a cold or the flu! * Add in some "Red Hot" candies If it sounds good to you! My mom makes this for me every Christmas as one of my gifts.